Charles Roberts has been established in Ireland for over 20 years as a traditional maker of Uilleann pipes. He is originally from Northumberland in England, and started his pipemaking career with the Northumbrian smallpipes. He was also involved in restoration of Union pipes by the Northumbrian pipemaker Robert Reid from North Shields. The pipes are handmade from traditional materials as ebony, African blackwood, boxwood or rosewood for pipes and stocks. Brass, laquered brass, nickel silver or silver is used for ferrules and keywork. Bags and bellows are made from double thickness leather for air tightness. The bags are hand stitched and the bellows are hand nailed and studded to the wood. The pipes are available as practice sets, half sets, compact half sets, three quarter sets and full sets in concert pitch D and flat pitch C natural and B natural. 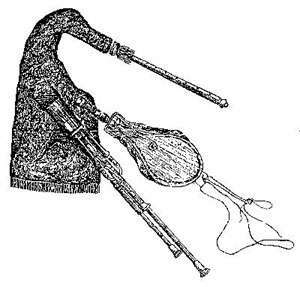 Northumbrian smallpipes are also available, ask for details. Through the years Charles has had the priviledge of restoring sets made by Robert Reid, Maurice Coyne, Timothy Kenna, the Taylor brothers (William and Charles), John Egan, R. L. O'Mealy, William Kennedy and Brogan... A section on sets restored by Charles is being planned and will be added as soon as it is finished. Charles' oldest son, Alan, started working with his father in 1995 and plays the pipes professionally in pubs, festivals, weddings and other occasions. He has played on six recordings and is finishing off his first solo album. Alan is available for piping concerts, touring and lessons.